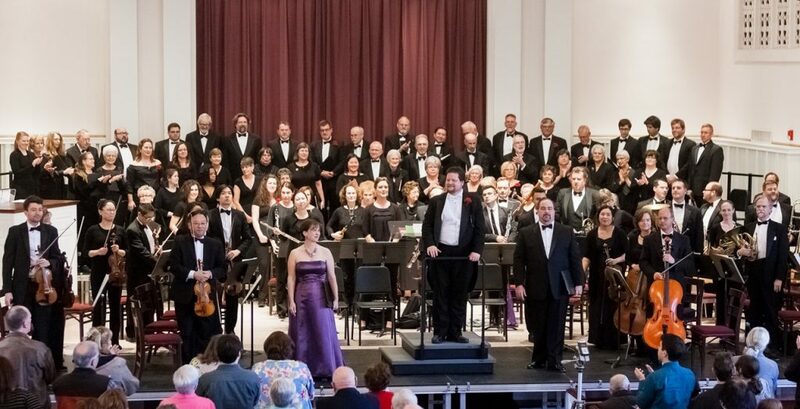 Elmhurst Choral Union is an auditioned volunteer chorus, singing with a professional orchestra and soloists, performing classical masterworks and great choral music of all eras. We are located in Elmhurst, Illinois, a western suburb of Chicago,, in DuPage County. Elmhurst Choral Union was founded in 1952. Our repertoire has included Bach, Beethoven, Bernstein, Bizet, Brahms, Bruckner, Dvorak, Handel, Haydn, Jenkins, Lauridsen, Mozart, Puccini, Respighi, Rutter, Schubert, Vaughan Williams, Verdi, Vivaldi, Wagner, and more. As guest artists with local symphonies, we've also sung works by Boito, Borodin, Faure, and Mahler. You should join Elmhurst Choral Union because you want to sing in pro-quality concerts with an orchestra! Our singers and conductor are friendly, and you'll have a great time singing with us. Don't be afraid! Our conductor holds low-key auditions, running you through a vocal warm-up and a song of your choice, to determine your vocal strength and range. If you've sung in a choir before you'll be fine. We rehearse on Tuesday evenings, with a Saturday rehearsal before our Sunday performances. Our singers are the key to our success! They support what we do, onstage and off, by paying annual dues and being financially responsible for 5 tickets per concert, and by helping us acquire program ads from local businesses. To our audiences, outstanding choral-orchestral concerts. To our singers, the thrill of singing with the Chicago area's finest soloists and instrumentalists, performing moving (and sometimes, rare) choral-orchestral repertoire. Elmhurst Choral Union shared a photo. Elmhurst Choral Union, guest soloists, and professional orchestra perform Liszt’s Coronation Mass and Schubert’s Mass in G, under conductor Scott Uddenberg. Both composers are best known for other musical pursuits. Liszt was the star pianist of his day, and his piano compositions continue to please (and challenge) pianists. Schubert is famous for his symphonies and his songs. Tickets are available from elmhurstchoralunion.org, (800) 838-3006, or at the door. Stacy has performed with the Chicago Symphony Orchestra, Lyric Opera of Chicago, Music of the Baroque, Chicago Opera Theatre, Elgin Symphony Orchestra, Evanston Symphony Orchestra, West Suburban Symphony Orchestra, and The Chicago Ensemble. She made her Carnegie Hall debut with the Chicago Symphony Orchestra in Strauss’ Elektra in 1995. Word is that the Notre Dame Paris organ is intact (and, we hope, not damaged by smoke). 😰 How do you deal with stage fright? 🤞 Do you have any superstitions? 😱 What has been THE most embarrassing moment of your career?